Cupola 3D in VRML - FLORENCE LIVE! For the others 3 models, piu' just those of the Spider, the Parchment and the Column Quarry, that they are models of a closed space, e' necessary to move with caution in order to avoid “to exit from the space of the model. This model has two link with other models, two particular and three predefined points of view. the income to the Spider is found on the inner part of the Cupola, to the apex of it. 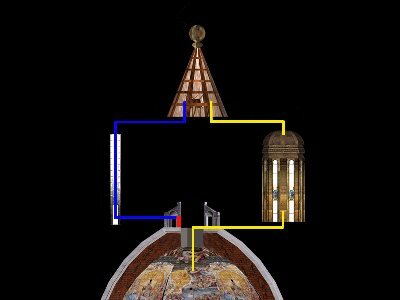 Of the 8 images 2 are available single; in order to render, the inside of the cupola more evocative the sun two sails (the quarter and fifth) have been brought back alternatively on the lacking positions. pylon: close to the income of the Column Quarry of the Brunelleschi.